PanARMENIAN.Net - 2016 was a peak year in terms of export, which hit record lows in 2009 ($697 million) and the highest in 2014 ($1,547 billion). Armenia mostly exports mining and raw industry products, foods, precious and semi-precious gemstones, metals, as well as cigarettes and alcoholic drinks. 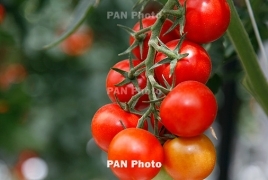 PanARMENIAN.Net presents the countries and goods that boosted Armenian export last year. CIS countries: Armenia’s export to CIS countries grew by 43.5%, totaling $411 million against $286 million in 2015. Export to Russia amounted to $371 million against $245 million in 2015, surging by 51,5%. Export to Ukraine totaled $8,43 million against $6,2 million in 2015 (29,7% growth). Export to Kazakhstan increased by 42,9%, totaling $5,9 million against $4,1 million in 2015. Export to Belarus doubled, amounting to $14 million against $6.8 million in 2015. Import from CIS countries totaled $870 million against $790 million in 2015 (10% growth). Goods to the amount of $740.9 million were imported from Russia, increasing by 14,4% against $647 million in 2015. Import from Ukraine decreased by 16,5% to total $100 million against $119 million in 2015. Food stuffs to the amount of $418 million were exported by Armenia in January-December 2016, which is 28.6% more than in 2015 ($325 million). The export of mining and raw industry products fell by 1,3% to total $470 million against $476,9 million in 2015. The export of precious, semi-precious gemstones and precious metals skyrocketed by 73.9% to total $337 million against $193,9 in 2015. The export of animal fat and vegetable oil increased by 11,2 times, totaling $625,000 against $55,900 in 2015. The export of foods of plant origin surged by 83.2% to amount $69,3 million against $37,8 million in 2015. Besides, Armenia exported objects of art to the amount of $1,2 million (82.5% growth).